Cordelia Snowdon (Left) and Katharine Barrette (Right) browse the Reserve Collection shelves behind the Service Desk on the main floor of the Library. Did you know the Library Reserve Collection includes required textbooks for a variety of courses currently offered at MRU? 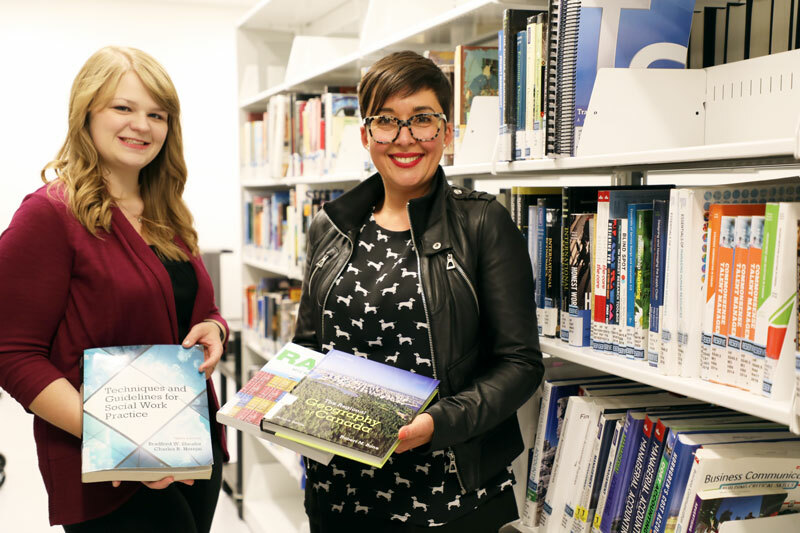 The Students’ Association of Mount Royal University (SAMRU) and the Library partner every semester to purchase new textbooks from the MRU Bookstore that are kept behind the Library Service Desk. The selection covers a variety of subjects and new additions to the collection are often decided based on demand from students as well as course popularity and class size. 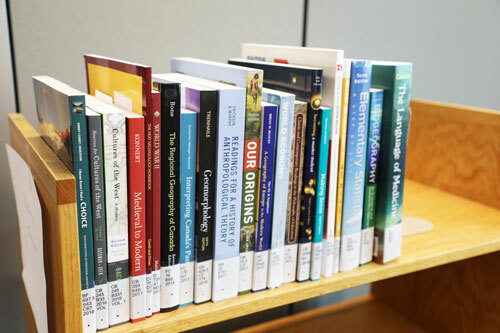 Many of the popular books in the Reserve Collection are available to students on a two hour loan while others can be borrowed for up to one week. Having course textbooks available for students to borrow is typically seen as a convenient option for students while on campus—this allows them to stop in to the Library and review course content before an exam. But there are a portion of Library users who rely on this resource as a temporary measure while managing their finances. The recent Fall/Winter 2018 textbook purchase allowed us to bring in textbooks for 36 courses offered here at MRU, which means that 1,800 students now have free access to their course text. Find textbooks the Library has available in the Reserve Collection by using LibrarySearch Course Reserve function. Enter the course name in the search tool and review results to find relevant materials available at the Service Desk. Gone are the last minute purchases in September, or the search in bookstores until you find that book exhausted. Times have changed, now parents compare prices in WhatsApp groups and July becomes the key month for buying textbooks.